It was almost seven years ago that I bought my first handplane. I’d met a couple of people on the beach, tested the boards they had on hand, had myself a blast, and ended up purchasing my first handplane an hour later, with cash, on Zuma Beach in Malibu. Steve Watts, the guy who sold me that board, started it all by using fast food trays and flip flops as handplanes in South Africa. That same ingenuity landed Watts and his wife Angela on ABC’s Shark Tank, where Mark Cuban and Ashton Kutcher invested $200,000 in their upstart business. Today, Slyde Handboards is a booming company who dominates the ocean industry more than any other company in the market. With summer around the corner now, the company is about to share its latest innovation with the world, which is actually more familiar than you’d expect. They’re introducing foam handplanes, just like full-size foamboards have become the affordable and popular entryway into surfing. Who would have known? Teaming up with Kaha Nalu, a bodysurfing apparel, and equipment company out of Hawaii, Slyde is continuing their mission “to globally grow the hand boarding and bodysurfing community,” said Angela Watts, co-owner of Slyde Handboards. 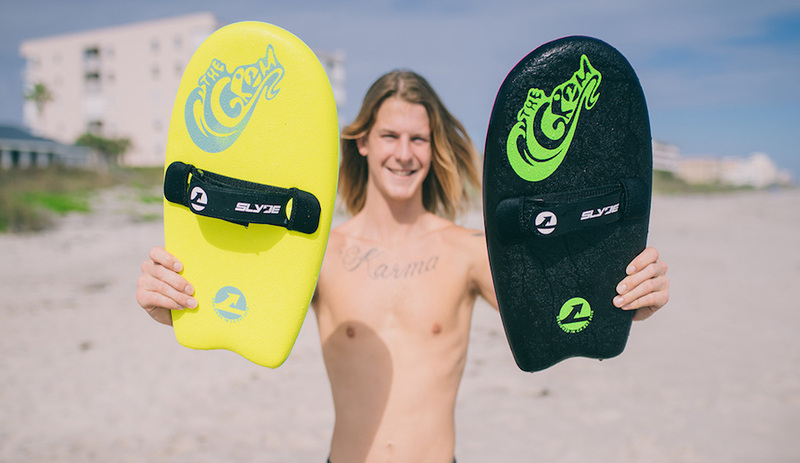 Instead of taking a chunk out of bank accounts, Slyde decided to give people the Grom Board. It’s a beginner board at first look and a powerhouse at heart, the Grom board is much cheaper from its counterparts and it also shreds like mad. The boards getting crazy reviews as one of the top notch hand boards on the market for the best price. Tahitian’s are drooling over it, Hawaiians are shredding on it, while folks along the coastline are still waiting. The company is actually in the midst of its latest Kickstarter campaign to pay for the first round of productions that would distribute The Grom to everybody. The board is made entirely different from its counterparts within the Slyde Hand Board market. It looks like a board that you can still throw, literally, into your car and make your way to the beach. Did I mention it’s completely affordable? The crowdfunding campaign, which easily doubled its $10,000 goal, has the retail price for the customizable boards listed at $59. Meanwhile, some of them are going for as low as $39 while the Kickstarter is still up and running. For reference, some of Slyde’s traditional shapes and models can run up to $200 – a fair price on today’s hand board market. So yeah, the affordable foam handplane is now a thing. Note: Check out Slyde Handboards Kickstarter here.